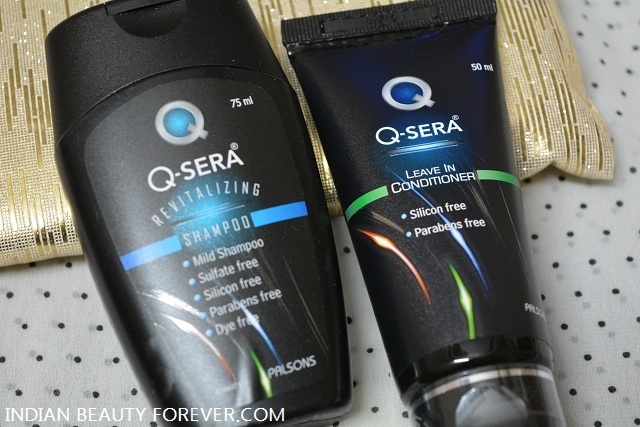 Price: Q Sera Revitalizing Shampoo is for 495 Rupees for 150 ml and the leave in conditioner is for 495 rupees for 100 ml. I liked that. I need the same quantity as I take with most of the other shampoos to wash my hair unless I have oiled my hair. 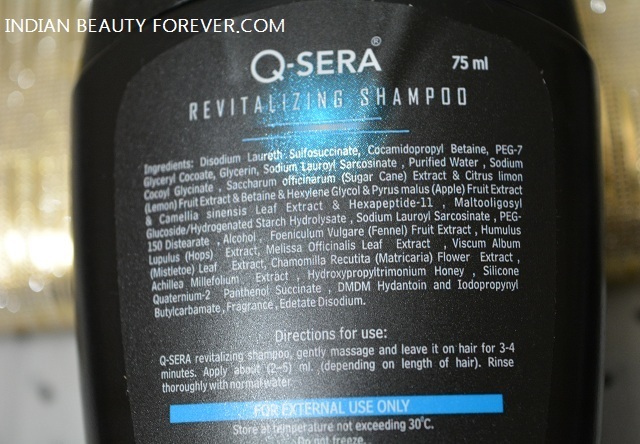 So, with this Q Sera Revitalizing Shampoo too I feel that it cleanses the scalp thoroughly and gets rid of the product residue well. After the wash my hair felt good and I did not use any hair product like serum or the leave in conditioner that comes along with this only to check this shampoo alone and to know how it fares for my normal hair type. So, it make the hair shinier, which is good, hair are not as tangled which is again very good. But I felt that my scalp gets greasy in a day. I have greasy scalp but normally I would wash my hair after 2-3 days but with this I have to wash daily. 1. The shampoo is mild enough to be used daily like for boys and girls who likes to go for daily hair wash.
2. Secondly, this will be good product for dry hair as compared with other shampoos. 3. And at the same time this may not be the best option to go for the oily hair especially in summers. So, these three things have summed up this product, I hope. I liked this as I can wash my hair daily so, while I was testing this I had no issues. But if someone who have got normal scalp then they would like this shampoo and can use this every 2-3 days like we normally do. 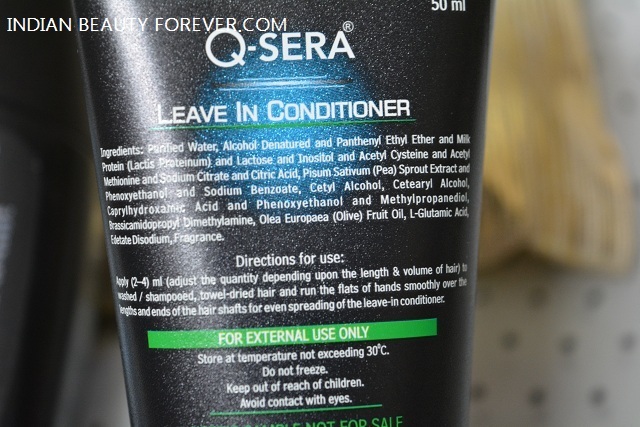 Now coming to the Q Sera Revitalizing leave in hair conditioner. First I thought it would be a hair conditioner that had to be applied right after the shampoo and had to be washed. But when I read the label then I realized that this is a leave in hair conditioner. I am testing 2 such products at the moment by the way. This leave in conditioner is a creamy thick product. That we need to take in our palm and just rub over the semi dried hair. I like that this does not smell too much. And makes the hair softer so that the tangles are combed out easily without too much of the hair breakage. This helps to moisturize the hair, detangle the knots and makes the hair smoother which it does. This will be good when one has very dry hair. As very dry hair type needs something that can make the hair softer. There are some of us who would like to use product which are mild and free from chemicals like sulphates, silicones and parabens then these can be a good to try product. 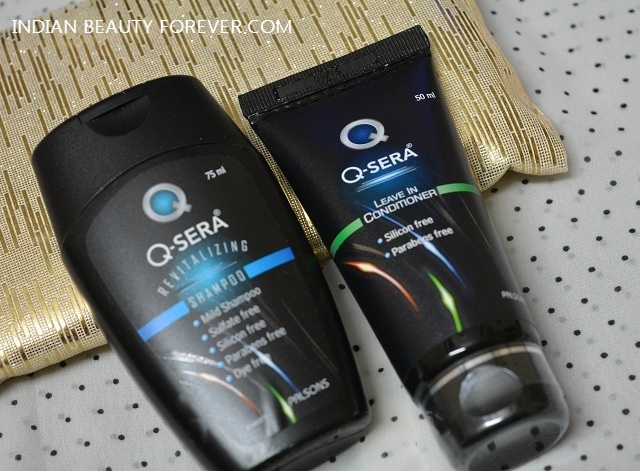 Both of these Q Sera Revitalizing Shampoo and the leave in conditioner are decent products but the price is quite high as compared with the other shampoos in the market. So, I would say they are good products if you really want to try as they are dye free, paraben free, sulphate free and silicone free.